Until I get my thoughts under wraps this post will mainly be an update on the Sonzee Bear (pictures included). We checked in the PEMU on Monday morning. We have been scheduled to come for 3 weeks due to concerns about Sonya entering into the next phase of CDKL5 seizure activity. We were hoping Sonya would be part of the 50% of kiddos that would not have infantile spasms. (Do yourself a favor and don't google those :-)) Her seizures lately have gotten upwards of 2-3 minutes with the beginning looking more like a typical seizure. 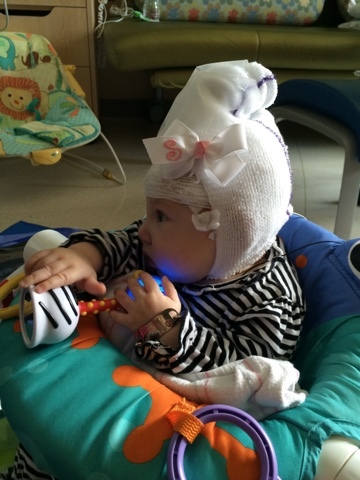 At the 1 minute mark she would start to reach out and then come forward and she would do many in a row, so we thought it would be good to get her on an EEG for continuous monitoring. Sonya has always been great when it comes to being in the appropriate environment and showing off her skills. After we were hooked up on Monday, Sonya had her first episode. It was logged and I briefly spoke with the epileptologist but she had not reviewed her EEG log. She went on to have another episode at night. On Tuesday I met with the epileptologist while she was doing her rounds. Sonya is having a tonic generalized seizure for the first minute (which we assumed), and then at the 1 minute mark they turn into epileptic spasms. 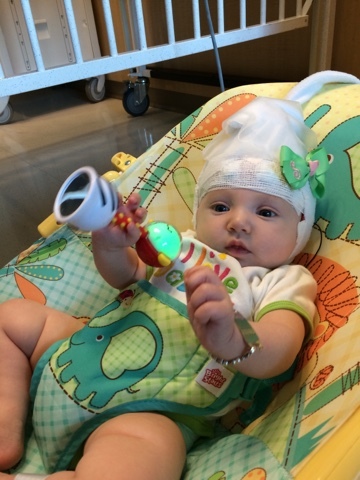 They are not the hallmark infantile spasms because her EEG background is still normal, but they are a variant form. The epileptologist does feel they will eventually become infantile spasms...but I am still going to hold onto the hope that they will remain spasm like. To be honest, not sure if it really makes a difference, as treatment options are honestly sucky regardless, but we can save that for another post. We are currently still here, we were waiting to see if we could catch these quick eye blinks she does while here to see if those are actual seizures. Unfortunately I have not seen them. We will hopefully be discharged today after rounds. 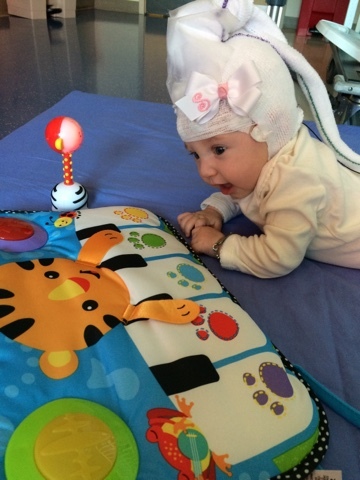 She does make the EEG monitoring look adorable! !